Also known as the Sorteo Extraordinario de Navidad or Loteria de Navidad, the Spanish Christmas Lottery is the biggest in the world. It is played by 90% of the Spanish population which equates to around 40 million people. It creates hundreds of new millionaires in one day and pays out a massive £2.2 billion! 2017’s draw is on the 22nd December 2017. In the past the Spanish Christmas Lottery could only be played by people living in Spain however now it can be played by people overseas online. If you were to buy a ticket in Spain you would have to pick from whatever numbers had been allocated to certain sellers. This means that Spanish people will travel for hundreds of miles across the country to find the ‘lucky’ number they want to buy. By playing online you can select whatever numbers you want from the comfort of your own home. PlayLottery You can play the Spanish Superdraw online at PlayLottery. For just £20 you get 10 Decimo Tickets worth €200 and you will win 1/50th of all prizes garanteed. 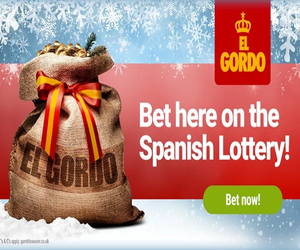 By getting your Spanish Superdraw Syndicate Entry at PlayLottery you are guaranteed to win one cash prize in the Christmas ‘El Gordo’ draw. On top of this you are also guaranteed to win a cash prize in January’s ‘El Nino,’ July’s Spanish Superdaw and the 9 other superdraws throughout the year. You can sign up at PlayLottery and play 55 EuroMillions entries for just £1 then from within your account add the Spanish Superdraw Club. LottoLand We highly recommend buying your El Gordo Christmas Lotto tickets here. You can select how many shares you want and how much you want to pay starting from just £4.99 for 1/100 share right up to £200 for a full ticket. There are loads inbetween you can choose from.For new customers you will also get a money back guarantee where if you don’t win anything on your first ticket you get your money back. You can also take up their special offer and get 6 EuroMillions tickets for the price of 3. Wintrillions This is another great place to play the El Gordo Christmas Lottery. Rather than playing on your own and getting shares for the draw you can play here as part of a syndicate. This greatly enhances your chance of winning a prize. By paying £32.50 you will share a massive 100 full tickets with 250 other syndicate members. Giving you the chance to win loads of money. Also for playing today you will get 100% of your first deposit back up to £50! The rules are much different than the UK lotteries that we are all used too. Rather than sharing the pot with a few lucky winners like on the National Lottery the prizes are smaller but the wealth (£2.2 billion) is shared with lots of winners. This means that your chance of winning a prize is much higher than on any other lottery. You actually have a 1 in 7 chance of winning as much as €1000. The El Gordo rules can get quite complicated but you find full details on how to play here. There’s also loads more information about the rules of the draw on the lottery sites before you buy your ticket. You can play via the links above any Worldwide lotteries through our website. You will also get some free tickets and special promotions.